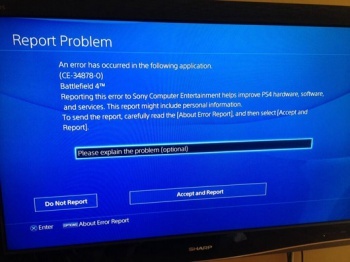 PS4 users are reporting a widespread data corruption error that is wiping save games and rendering games unplayable. Some users that already have their hands on Sony's fancy new PlayStation 4 console are experiencing a rather nasty bug, that can wipe save files and render games unplayable. It's even "bricking" consoles in rare circumstances. A 34-page thread on the official Sony forums contains widespread reports of the error: "Error CE-34878-0", which does not appear to be isolated to any specific game. Joystiq reader "Jim" wrote reported the loss of 30 hours' worth of progress as a result of a glitch. So far, users have reported seeing it in NBA 2K14, Call of Duty: Ghosts, Battlefield 4, and Assassin's Creed 4: Black Flag. Error CE-34878-0 can also, reportedly, corrupt games to the point where they won't even launch anymore. In rare circumstances, it will prevent the user from launching any of their PS4 applications. Forum members have suggested a variety of solutions to the issue, ranging from save file deletion to a full console replacement. There doesn't seem to be a "quick fix" for the bug as of yet. We have reached out to Sony for comment on the bug, and will update this story as we learn more.